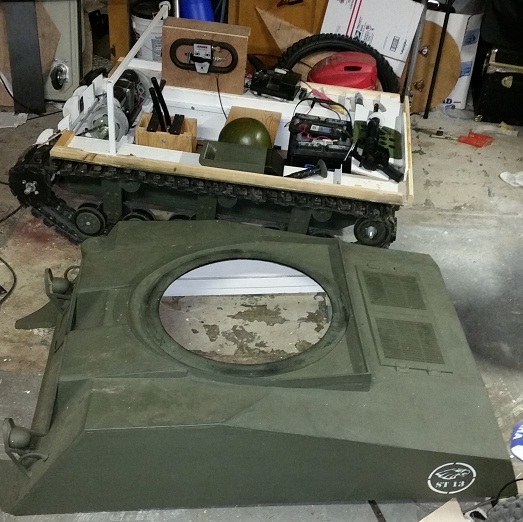 Since the drivers of the tank are kids, I spent some extra time making impact resistant firewall and chain guard. 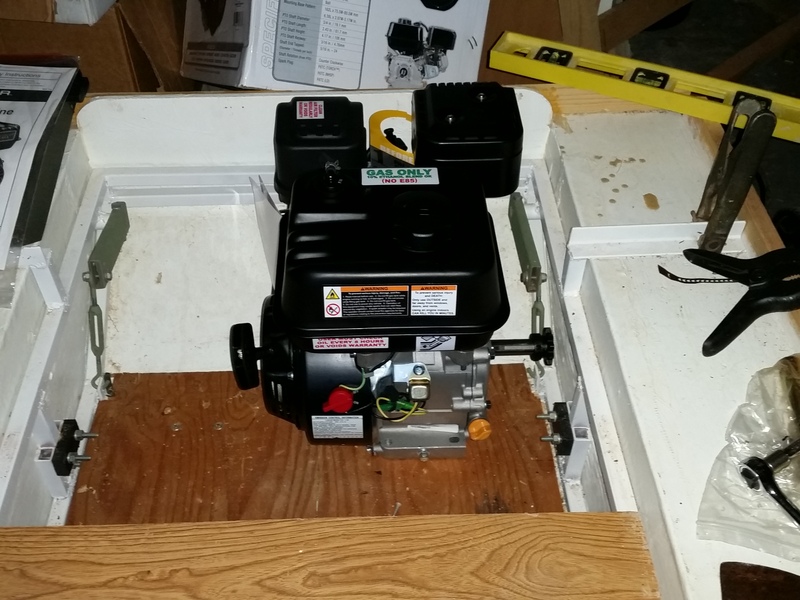 The engine firewall is 1/4″ uhmw with wood supports. 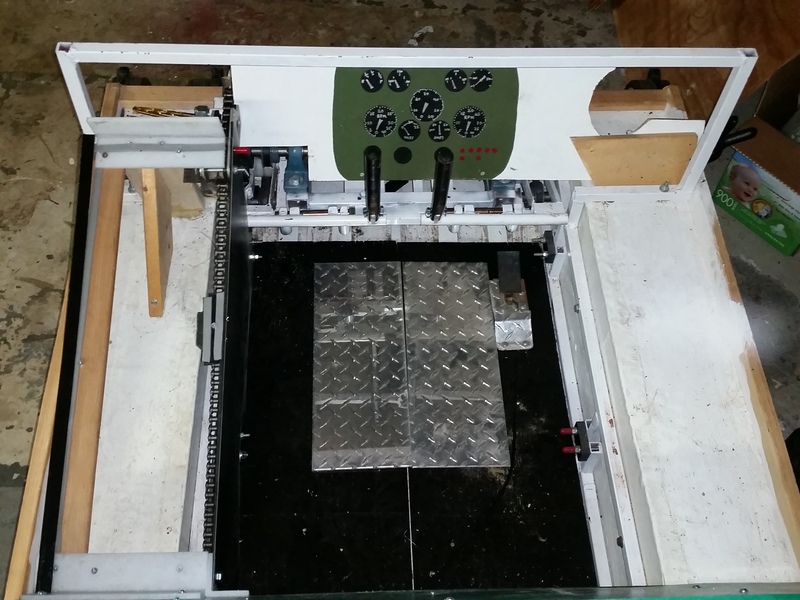 The chain runs right next to the driver so I made an enclosure of uhmw and plexiglass. I used plexi so I can still see the chain to watch alignment, tension, etc. 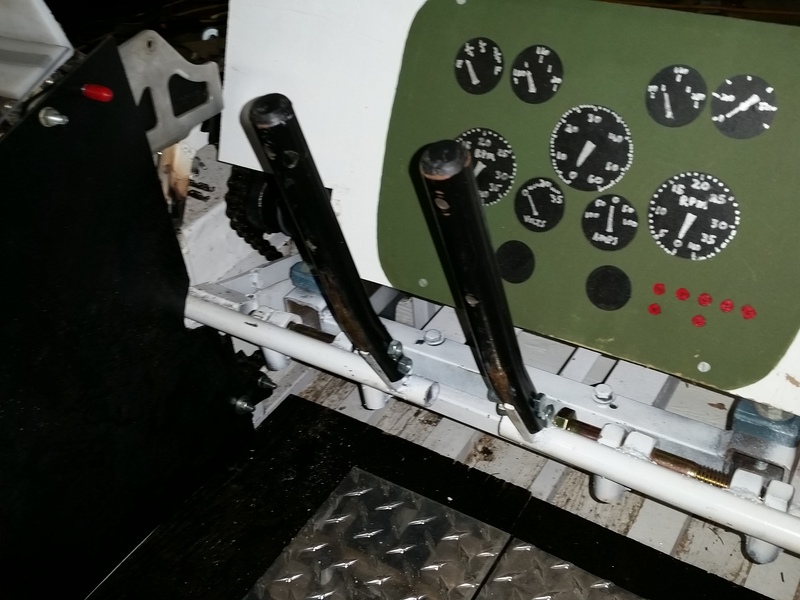 I reused the levers from the old electric control box. 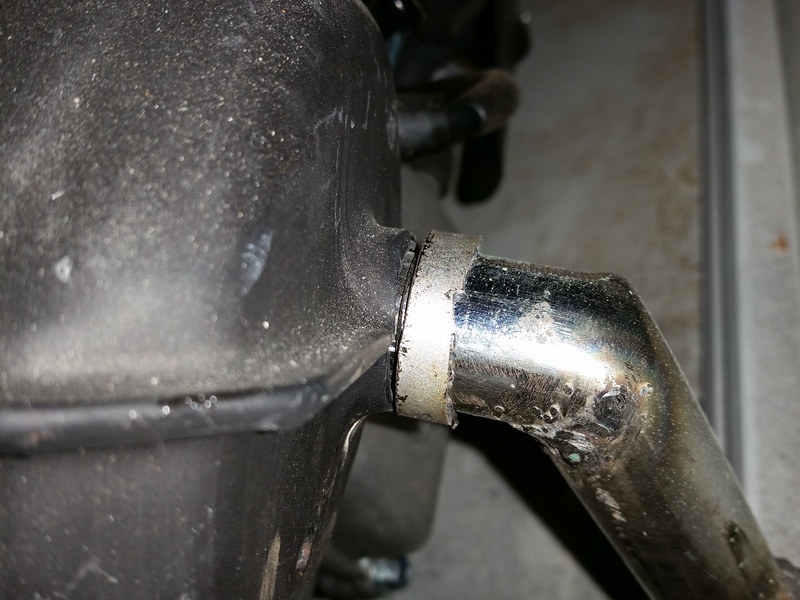 And now I’m working on a tailpipe to keep exhaust out of the drivers area, gonna fit an o-ring and flange to bolt it on. I got the new power plant and set it in place, and it fit’s great. 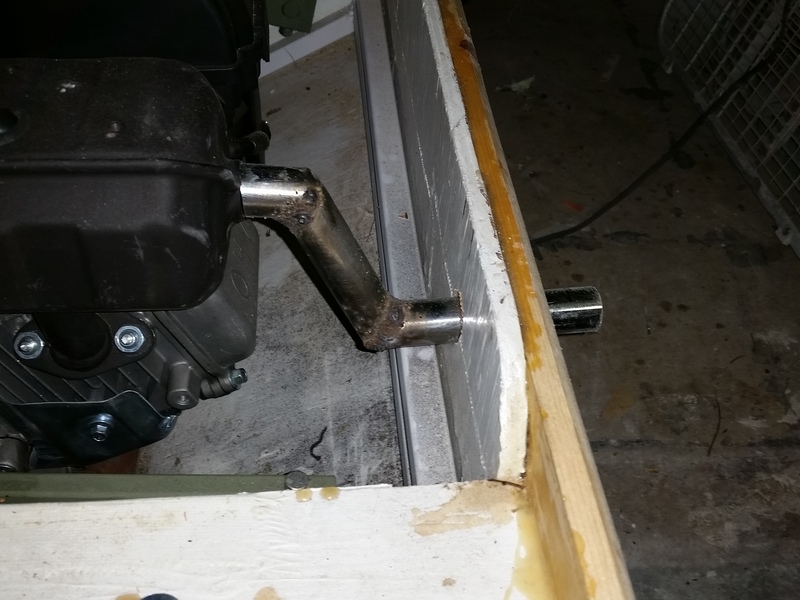 It’s a 6.5 hp engine, with 3/4″ output shaft. 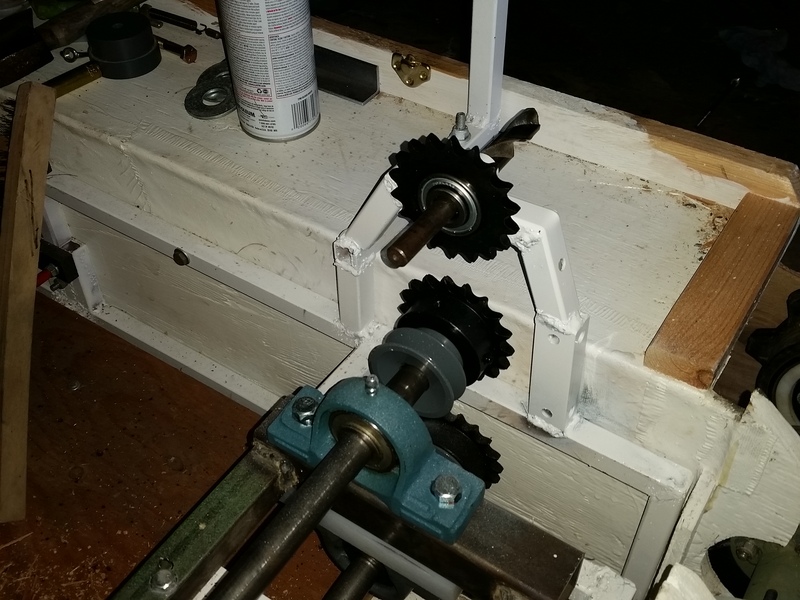 I put a 10-tooth sprocket on it because it will be direct drive constantly spinning the 2 counter-rotating shafts. No clutch or anything is needed, as that is handled by engaging the belts downstream, just like a riding lawn mower. 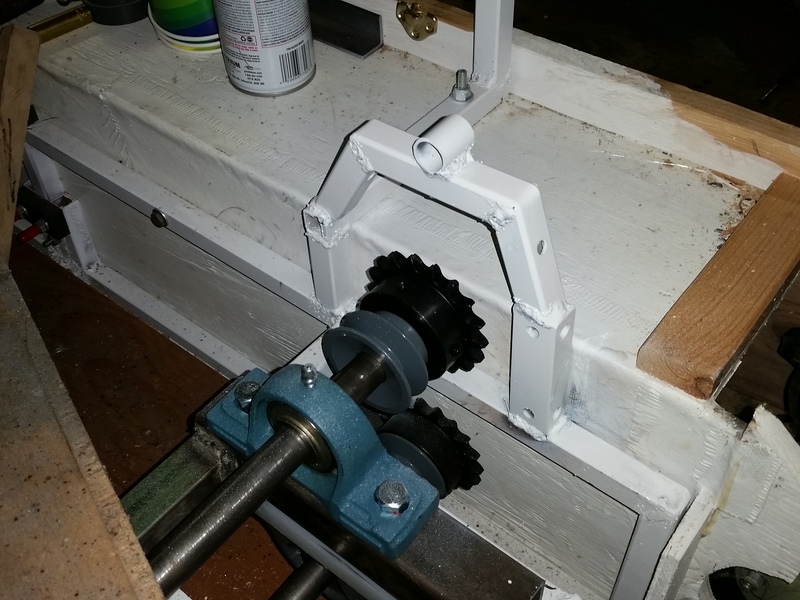 I also welded in a structure to hold the idler sprocket (which is needed to make the chain drive the shaft sprockets in opposite directions, as explained in a previous post). The idler sprocket has it’s own 5/8″ bearing, so I just need a short 5/8″ bolt and it’s ready to go. 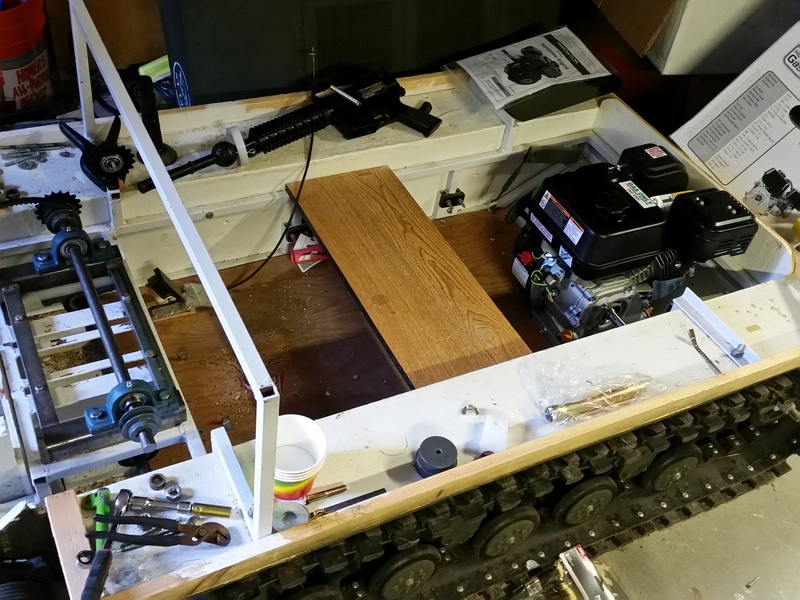 Now it’s time to make permanent motor mounts, run the chain, and install the drive belts. I finally got the transmission shafts in place. I built a little rectangle out of steel to bolt the bearings to, so they bolt right in and I can change them as needed. 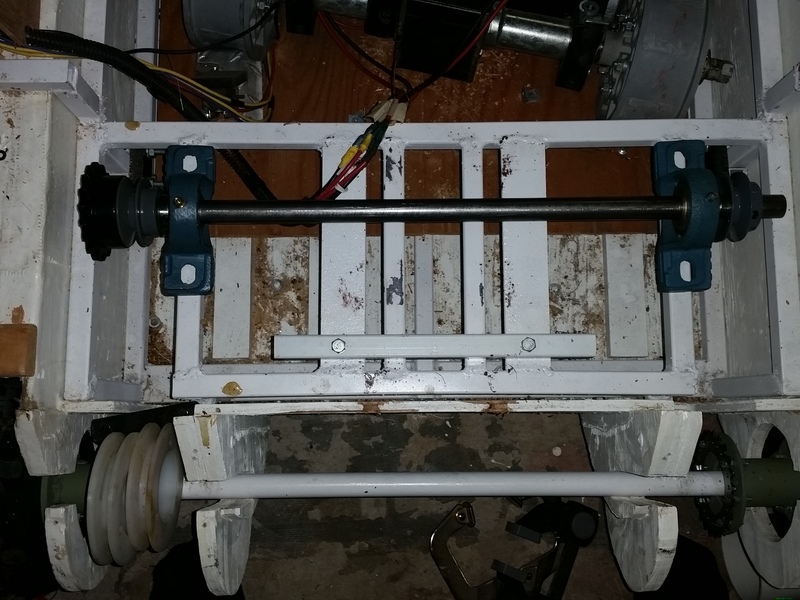 I had to put in 3/4 thick (white) UHMW spacers for the bottom bearings, for shaft clearance under there. I also got the double-pulleys onto the the track drive sprockets. So now I am ready to measure, and go find the (4) v-belts I need. 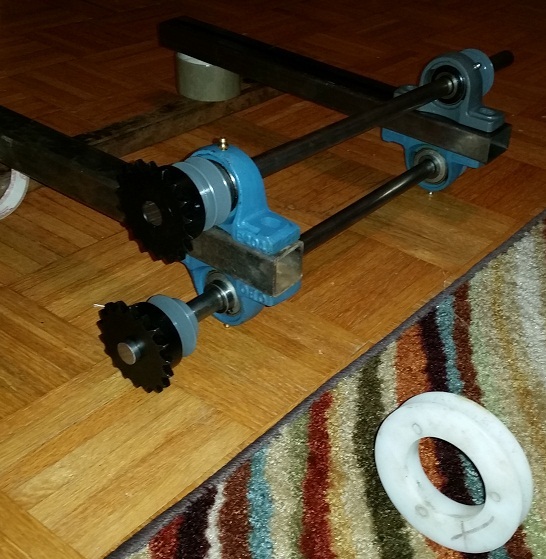 Before finally installing everything, I laid out the pulleys their approximate relative distances they would be from each other once installed, to verify the idler position and where it will need to swing to tighten the belts enough to engage the pulleys on the track drive sprockets. 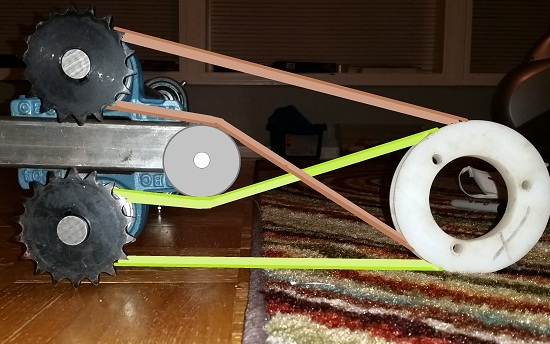 From this angle you can see how moving the idler up would fully engage the brown belt (reverse spinning), down would engage the green belt (forward spinning). 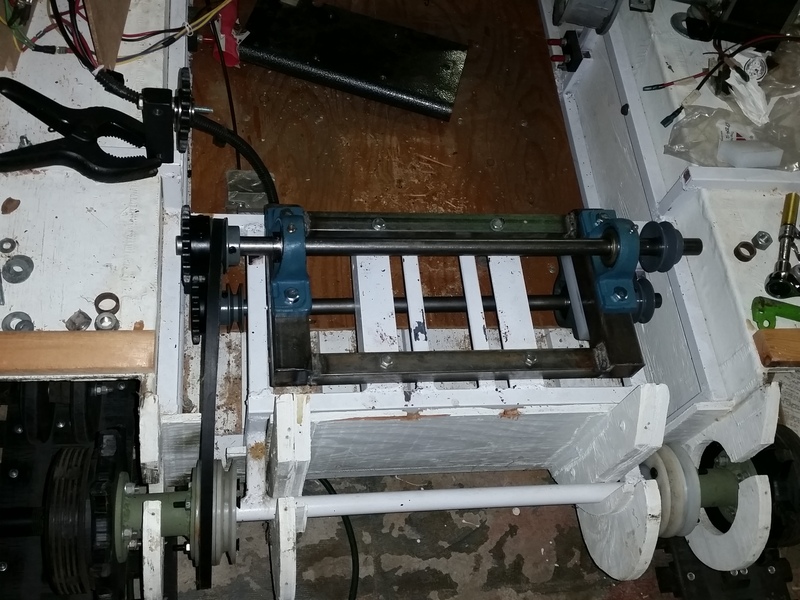 It also became evident once I laid this out, that moving the idler forward or backwards (left or right in the picture) will loosen or tighten the belts at the idler rest position. 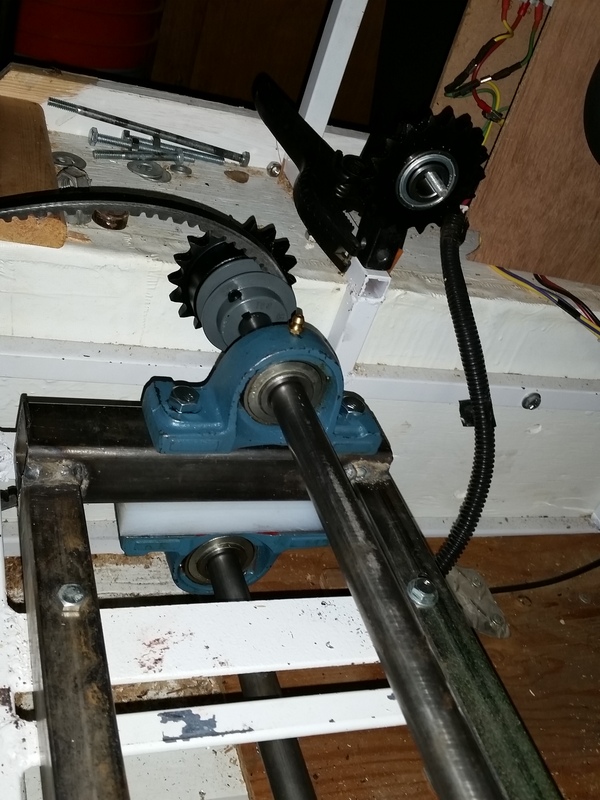 Good to know when I make and position the idler actuator arm later. 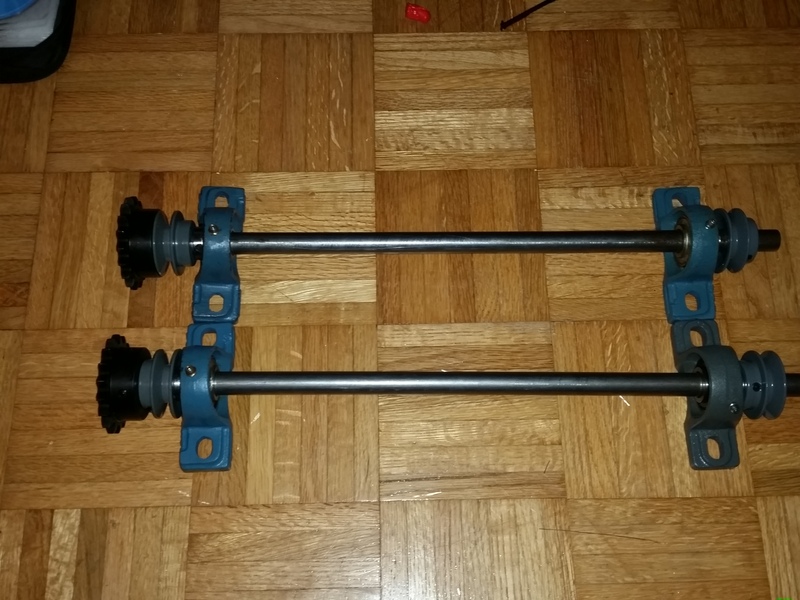 I began assembling the transmission drive shafts. These are 3/4 solid steel rods, which I will need to cut a few grooves into for the pulleys keyways/set screws. 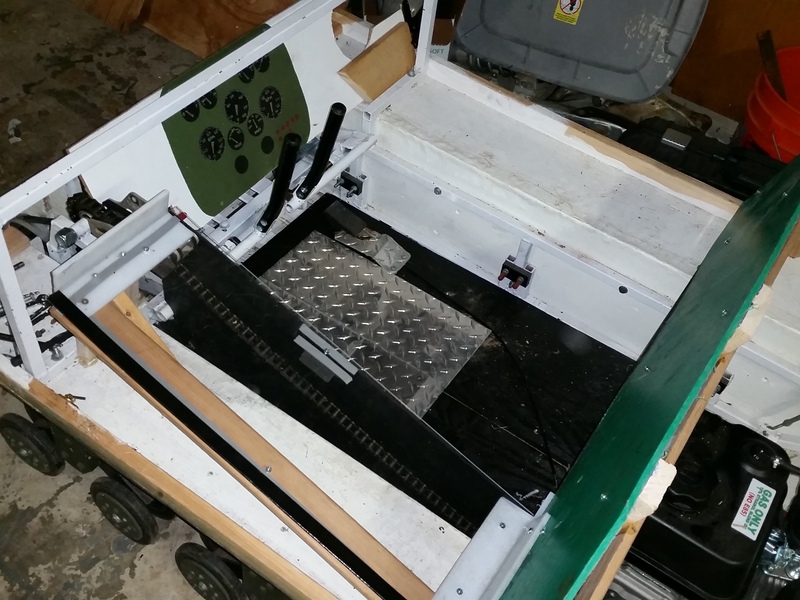 So far everything is looking like it is gonna fit and align perfectly. One will be constantly sipping in forward, and the other in reverse when the motor is running. There is no sort of clutches or anything. Here are both of the shafts. Once installed one will be right below the other one, and the pillow block bearings will bolt to the frame with the same bolts. I will weld in some mounting plates to bolt the bearing’s to the frame, since the holes would weaken that 3/4″ tube too much. The white pulleys on the track drive sprockets are just set in place to show basic alignment. Well, here goes. 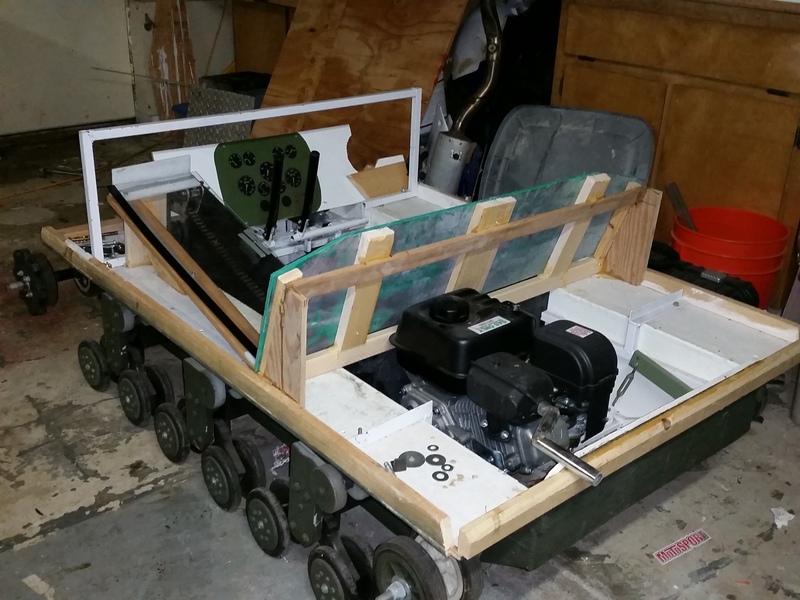 Taking the tank apart, pulling the electric motors, and swapping in a gas engine with a idler engaged pulley style transmission. 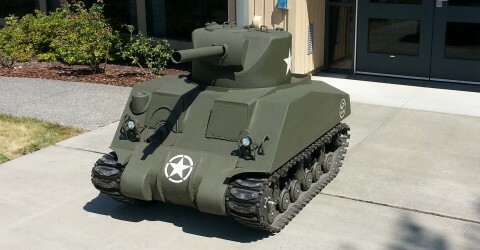 I’m tired of the 1hp from the electric motors, and not being able to have the tank really drive anywhere fun. Will probably go with a 3 to 6 hp engine in the back, and transmission in the front. Here’s the basic plan for the transmission. The motor spins 2 shafts in opposite directions. 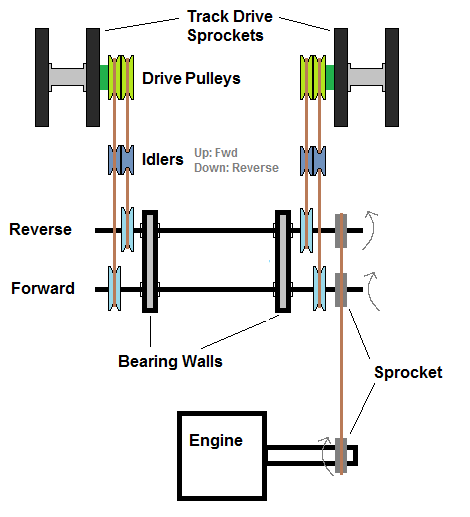 Each has a pully on each side, which can be engaged with an idler, giving the 4 options: Left Forward, Left Reverse, Right Forward, Right Reverse. 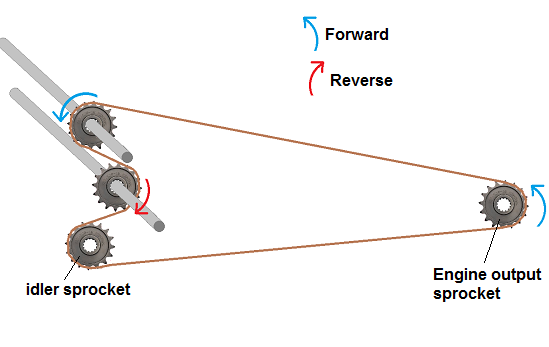 To turn the 2 shafts in opposite directions, the current plan is to have the chain wrap around a sprocket on each shaft, and an idler to give the proper clearance. 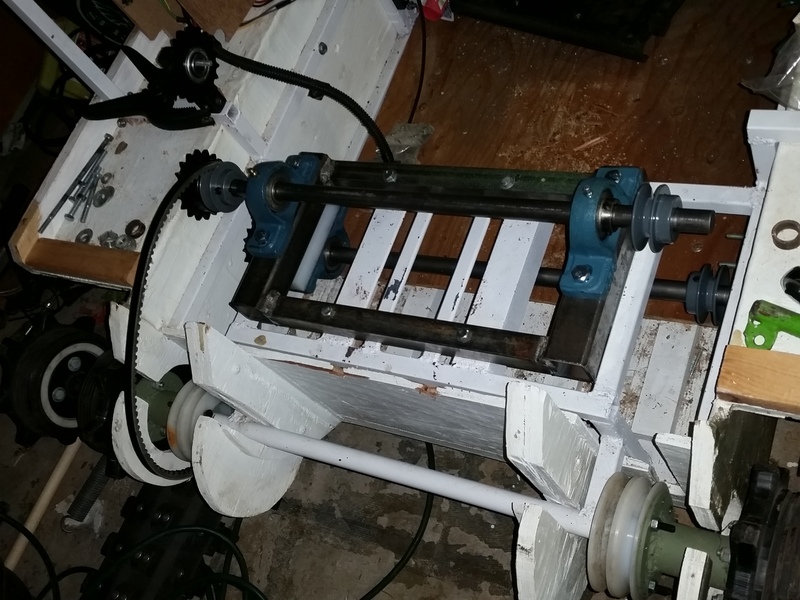 The other option is to drive one shaft with the motor, and have it drive the other shaft in reverse via cogs/gears. But I’m leaning toward the chain method. 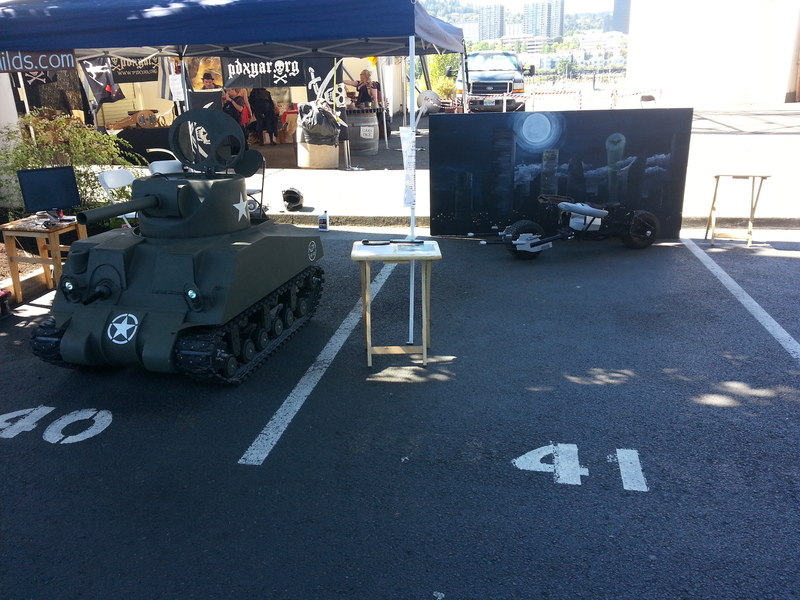 I had the tank on display at the Portland Mini Maker Faire at OMSI (Oregon Museum of Science and Industry) over the weekend, along with my current Batpod build. 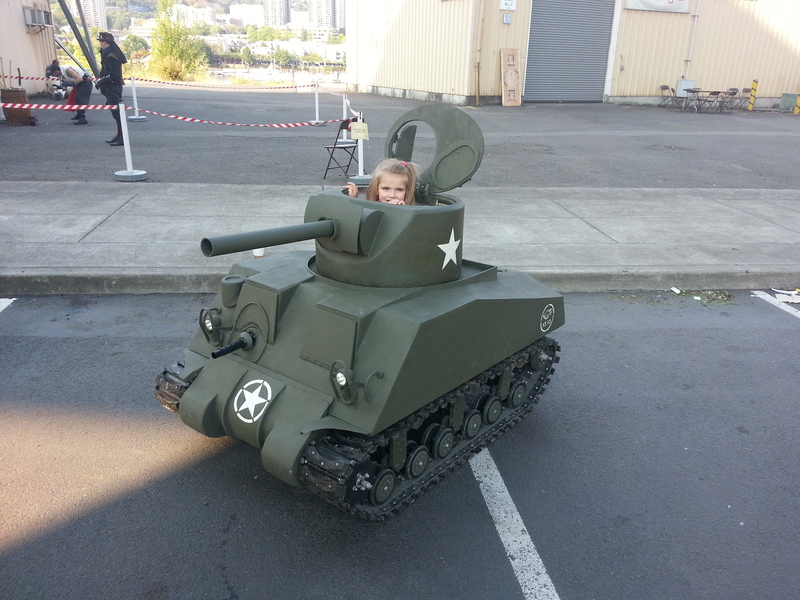 I had some helpers drive the tank around, and the kids there had a great time getting in it, sticking their head out the hatch and getting their pictures taken, etc. 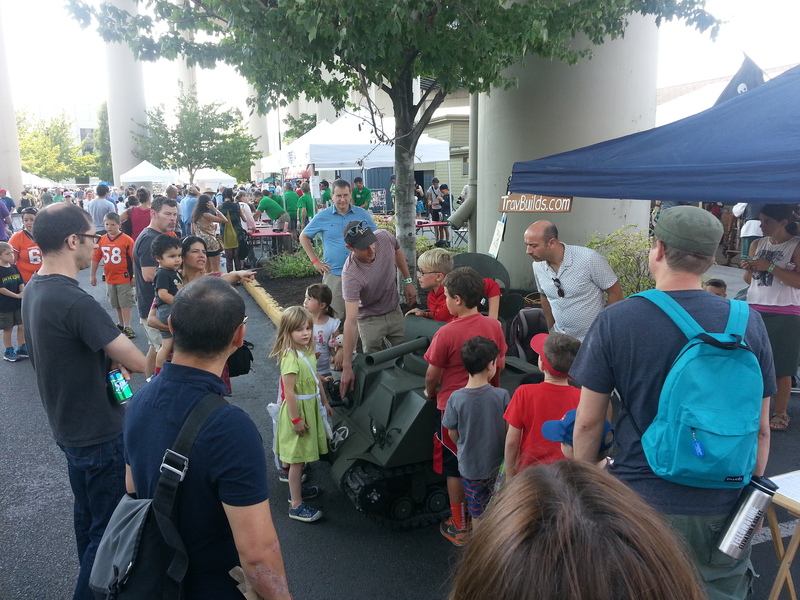 Here are some pics of the great weekend, and I’ll have a video soon as well. 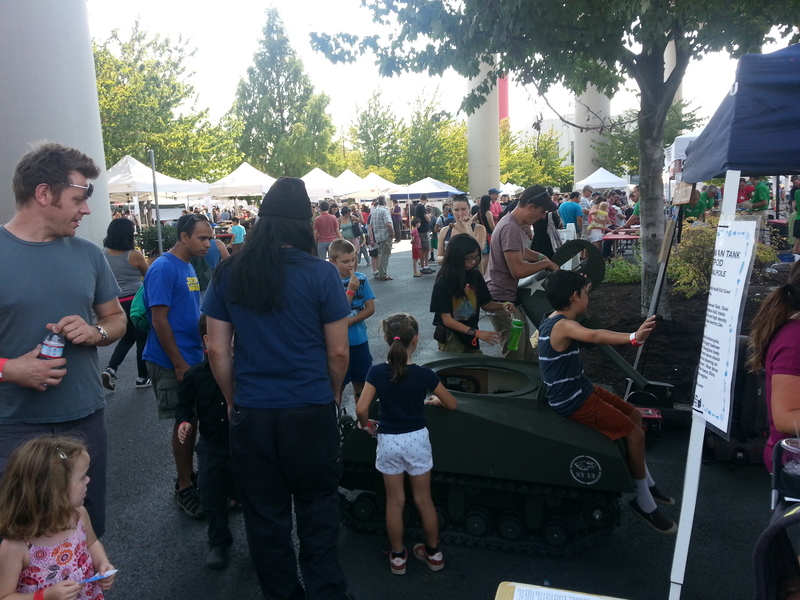 Thanks to OMSI for having us. And a BIG thanks to all my helpers.